It is an absolute pleasure to welcome a true English eccentric today in the shape of millionaire politician, writer, builder and consummate collector, William Beckford. The Fool of Fonthill assembled one of the finest art collections in Europe and was responsible for magnificent architecture and Gothic fiction alike, living high on the hog and surrounded by scandal in the long 18th century. Beckford was born to Maria Hamilton and William "Alderman" Beckford, twice Lord Mayor of London and a man who had made a vast fortune from Jamaican plantations. The family lived at 22 Soho Square and when the Alderman died in 1770, the 10 year old Beckford inherited £1million and land and property in England and Jamaica. The young man enjoyed an extensive and privileged education, briefly tutored in music by a certain Wolfgang Amadeus Mozart, but without the late Alderman Beckford's influence his son drifted from his father's political interests, learning instead the pleasures of being one of the richest gentlemen in the kingdom. In 1782 Beckford undertook his Grand Tour and published his first book, Dreams, Waking Thoughts and Incidents. 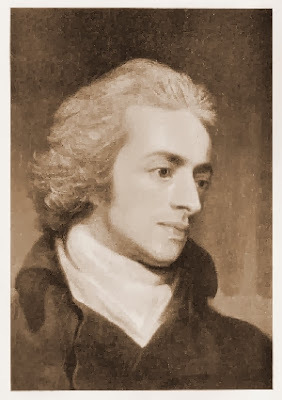 Returning to England, on 5th May 1783 he married Lady Margaret Gordon but his heart rested elsewhere, with William Courtenay, the future Earl of Devon. Beckford and Courtenay had first met in 1779 when the latter was just 10 years old and their relationship apparently grew beyond friendship as the years passed. Despite his ambivalence towards politics, in 1784 Beckford followed the path of the monied landowner and became Member of Parliament for Wells, though this was to be nothing compared to another, fateful occurrence that happened that same year. 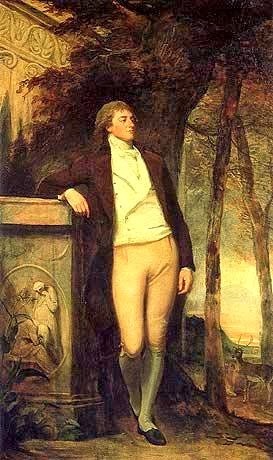 With his liaison with Courtenay in full swing, Beckford was engulfed by scandal in 1784 when Courtenay's uncle, Alexander Wedderburn, Lord Loughborough, claimed to have discovered explicit love letters between Beckford and the boy. Outraged, Loughborough took his story to the newspapers and Beckford and Kitty, as he termed Courtenay, found their rumoured assignation splashed across the front pages. For months Beckford refused to be cowed, taking up residence with Margaret at Fonthill Splendens, his seat in Wiltshire, clinging to his parliamentary seat despite pressure to resign. Finally though, the Beckfords travelled in fine style to the continent, accompanied by a magnificent entourage befitting a man of wealth. Margaret and Beckford enjoyed a loving and devoted marriage and would eventually have two children before Margaret died in Switzerland, plunging her widower into despair. Grieving for his late wife, Beckford travelled throughout Europe and in 1786 published Vathek, his most famous work and one that he had first conceived of early in the decade. This gothic novel tells the tale of a hedonistic Caliph who descends into debauchery and sin in his search for ever more decadent thrills. Written in French, Beckford claimed that he completed the notorious novel in just three days and two nights and upon its publication the novel became hugely successful. Though Beckford would write other works, none were as popular nor as famed and the book enjoyed enormous popularity in England throughout his decade-long exile. Whilst on the continent Beckford began to amass what would become a priceless and eclectic collection of art, including porcelain and paintings. Without Margeret's company Beckford grew tired of life in Europe and resolved to return to England. Once again he took sanctuary at Fonthill where he went into seclusion, surrounding the estate with an enormous wall. What went on behind this fortress-like boundary had the gossips of England chattering like there was no tomorrow, whispering of scandalous orgies, an all-male harem and enough debauchery to make your eyes water. For all the gossip though, one thing we can be sure of is that Beckford was spending a lot of time thinking about architecture. 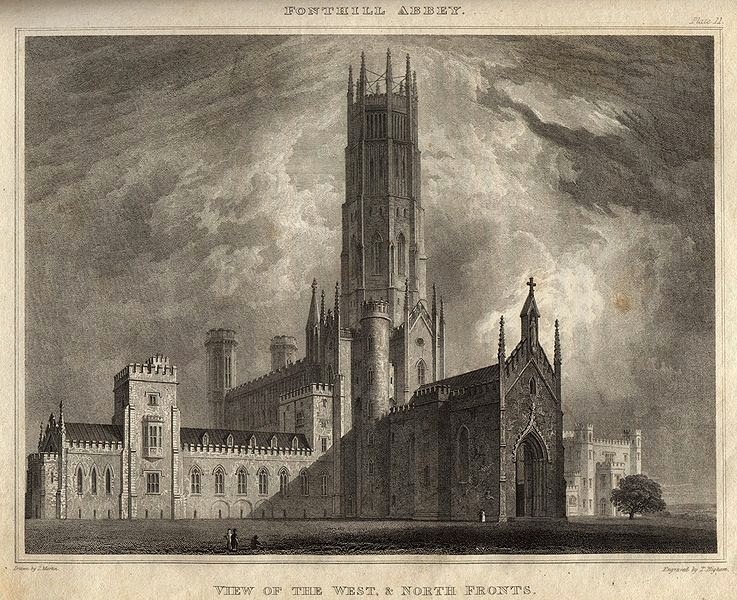 Calling in architect James Wyatt, Beckford laid out plans for a magnificent Gothic cathedral that would be his home, Fonthill Abbey. In fact Wyatt was far from single-minded when working on the project and was frequently absent, occupied instead with women and wine. Understandably displeased with his architect's behaviour, Beckford found himself fulfilling the roles of foreman and manager and eventually came to delight in these opportunities. Beckford lavished tens of thousands of pounds on the Abbey yet the project was beset with difficulties, the most serious coming when the 330 foot tall Abbey tower collapsed twice. Despite the catastrophes, in 1813 Fonthill Abbey was finished and Beckford took up a secluded residence, becoming increasingly eccentric as the years wore on. By now Member of Parliament for Hindon, Beckford had spent extravagantly whilst allowing his inherited business interests to wither and fail. Legal actions in 1822 forced the sale of two of his Jamaican plantations for a relatively small sum and with a heavy heart Beckford put Fonthill Abbey up for sale, the auction of its contents causing a flurry of excitement throughout the country. 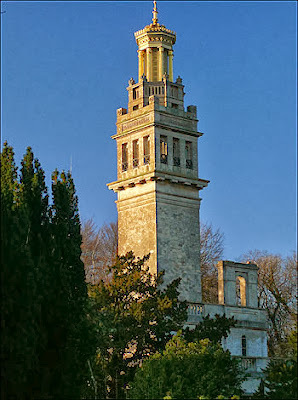 In fact, only three years after the sale, the tower at Fonthill collapsed again and the decision was taken to demolish the Fool of Fonthill's folly, leaving only a small piece of the building standing. Putting the disappointment of Fonthill behind him, Beckford took up residence in Bath though once again he turned his mind to building and had Henry Goodridge design and build Lansdown Tower, which stands to this day. He lived on in Bath until his death when he was buried in Bath Abbey Cemetery before being reinterred in a magnificent tomb of his own design very close to the Tower, the marble inscribed with extracts from his work. Though much of his collection had been sold during his lifetime, the remainder passed to his daughters, Susanna Euphemia and Margaret Maria Elizabeth. It may be that Beckford, with his ego, profligacy and eccentric ways, was not the most sympathetic chap we have ever met yet his life was one of constant drama and extravagance. We can never know the truth behind his scandalous relationship with Courtenay nor the reality of what went on behind the walls of Fontwell but Beckford remains a true character of the era, the Fool of Fontwell as fascinating today as he ever was. Just goes to show it's not always the greatest thing to inherit so young and have it easy! I feel sad for him. He couldn't have been very happy with such a conflicted life. Very interesting Madame! Thank you! I would tend to agree that his life seems very conflicted; I get the sense that he was never quite settled. Only yesterday we visited Dyrham Park and saw several items from Fonthill Splendens,Madame! We have several times wondered at Courtenays magnificent notorious four poster bed.Who would be surprised he was nicknamed Kitty with his numerous sisters and he the only boy! Thank you for welcoming him amongst us,Madame. Died in 1844 - Steam Age, Railways, Indudtrialissation, Telegraph etc.etc. He must have felt like a real hang-oer from an earlier age! What an amazing age to live through! Someone should make this into a film or a mini-series. Just imagine the treatment his life could get in a Masterpiece or Masterpiece-like production. Oh, that would be a must-watch! He may have had a heavy heart at the time, but I've always thought Beckford had the luck of the devil to sell Fonthill (for a very tidy sum) just a few years before it collapsed. Pity the poor bugger who bought it. 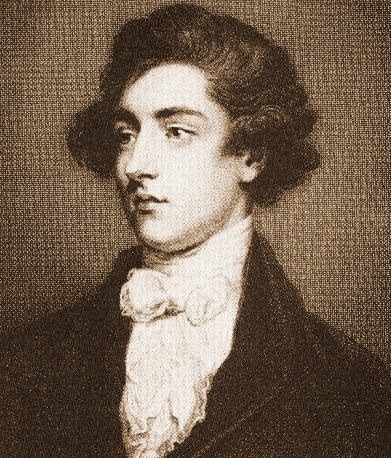 William Beckford had a fortune that derived from slaves forced to travel to Jamaica from Africa and then brutally exploited to produce sugar and rum. All credit to the Press and British Politicians for rejecting and ridiculing him. He deserved their criticism and his family carried on with his daft legacy.